Ingrid Mueller, the founder of “Latinas for Trump,” withstood hecklers and constant interruptions at a meeting of the West Hollywood City Council Monday evening as she opposed the removal of President Donald Trump’s star on the Hollywood Walk of Fame. The city’s council voted unanimously to remove Trump’s star due to his “disturbing treatment of women and other actions.” The city has no power over the Walk of Fame, which is controlled by the Hollywood Chamber of Commerce. 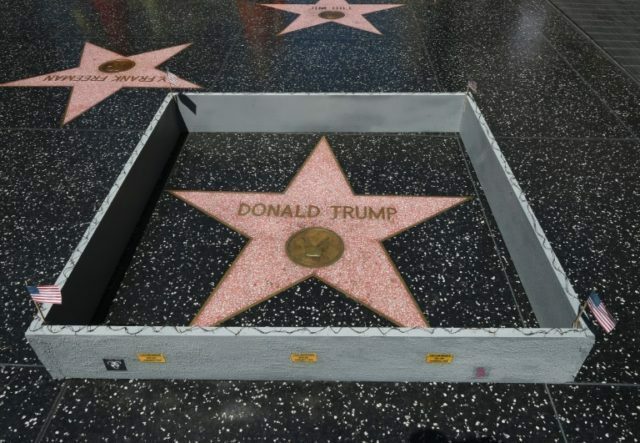 Trump’s star is a frequent target for vandalism. “I’m absolutely very upset and disappointed in the community that they want to take away Donald Trump’s star,” Mueller said before the council cast their votes. “I find that appalling. It is terrible,” to which a handful of members in the audience started applauding. Mueller is also the coalition leader for Mexicans and Women for Make California Great Again. When Mueller said, “He’s the president of the United States and he’s doing a great job,” a woman broke out in laughter. “The economy is doing well,” Mueller continued, to which the same woman laughed with a “Ha!” and a man could be heard shouting “Boo!”. “That’s your president,” another woman said. Mueller continued her floor speech despite constant interruptions. “Please leave the star alone. He earned it, he deserved it,” she said, to a mixture of applause and interrupting hecklers. In her floor speech Monday evening, Mueller continued to speak about the homeless woman who protected Trump’s star in 2016 after it was destroyed. “And there was a very fine homeless black lady that was protecting the star, and then some illegal aliens came over and beat her up. And President Trump ended up giving her money and helping this lady.” Trump did, in fact, help the homeless woman, who was later identified as Denise Scott. Harim Uzziel, who is a member of “Latinos for Trump,” told Breitbart News he was present at the West Hollywood City Council meeting. “My sister was there along with several other patriots,” Uzziel said. “I’ve been around since the beginning. Since Trump announced that he was running for president,” he said. Speaking with Breitbart News on Tuesday, Mueller said she was “appalled” and “disgusted” that the city would support the removal of Trump’s star. Earlier this year, West Hollywood gave a symbolic key to the city to Trump critic (and alleged paramour) Stormy Daniels.